1.) 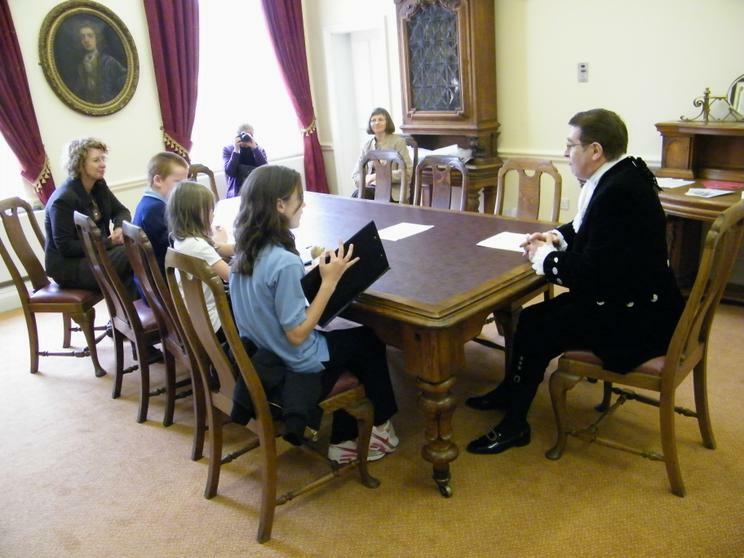 Can you tell us a little about the roles of High Sheriff? 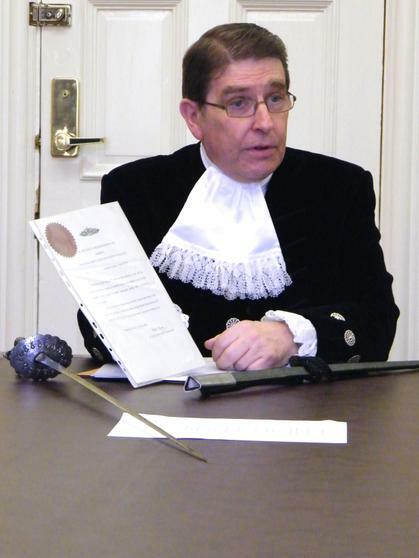 "Historically the role had great importance, I am one of two representatives of the Queen in the old county of South Glam, the Lord Lieutenant is the personnel representative while I am her representative to the judiciary (the system of courts which interprets and applies the law). I have given you some details of the work we do on a sheet. 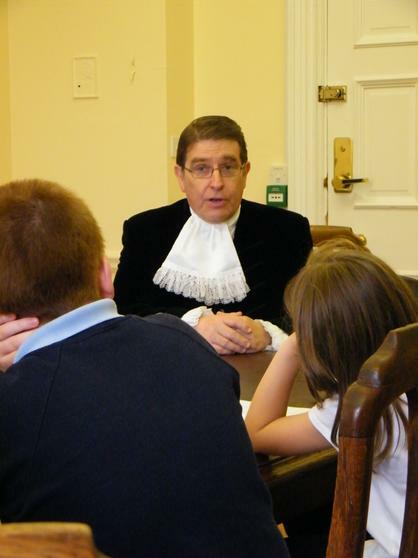 • I am responsible for the welfare of the High Court Judges who come down from London for 1-2 weeks to hear cases, they stay in a special house in Radyr but I ‘meet and greet’ and try and make them feel comfortable, they come to dinner at my home. 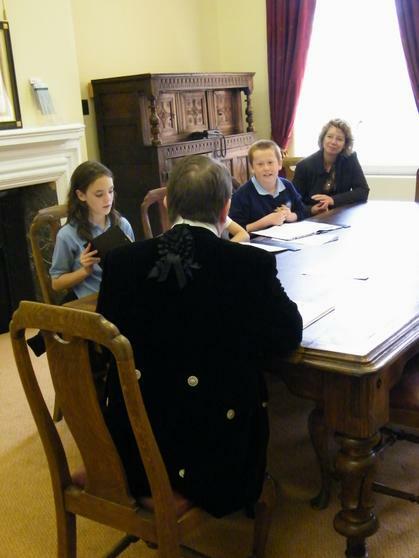 • Along with the Lord Lieutenant I also meet the Royal Family when they visit, I recently met Princes Anne. 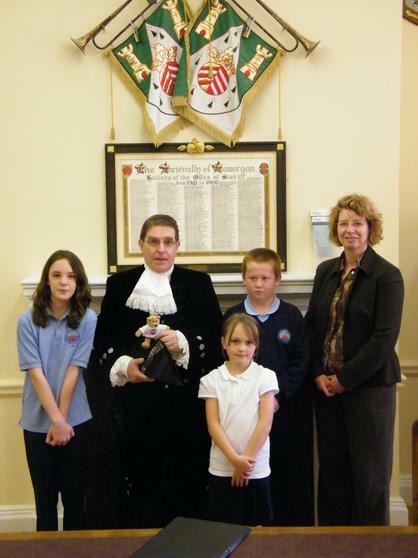 • Sheriffs do lots of civic activities, and I get invited to lots of mayor investitures etc. 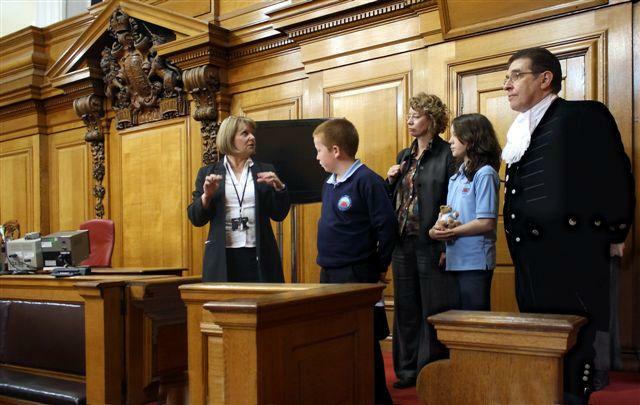 • I also do a lot of work for the High Sheriff’s charity." 2.) Can you tell us a little about your other jobs? 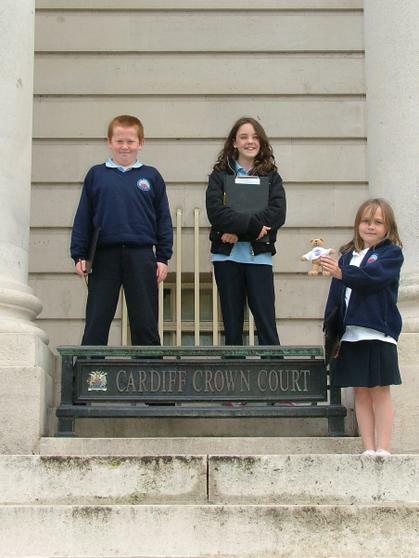 "Well I retired 5 years ago from my main job as Assistant Principal at the University of Wales Institute Cardiff UWIC." "I am on lots of Educational committees and I spend 2-3 days a week in London doing work for the Nursing and Midwifery Council. This has a register of all the nurses and midwives in the UK and ensures that they are properly qualified and competent to work in the UK." 3.) Where were you born? 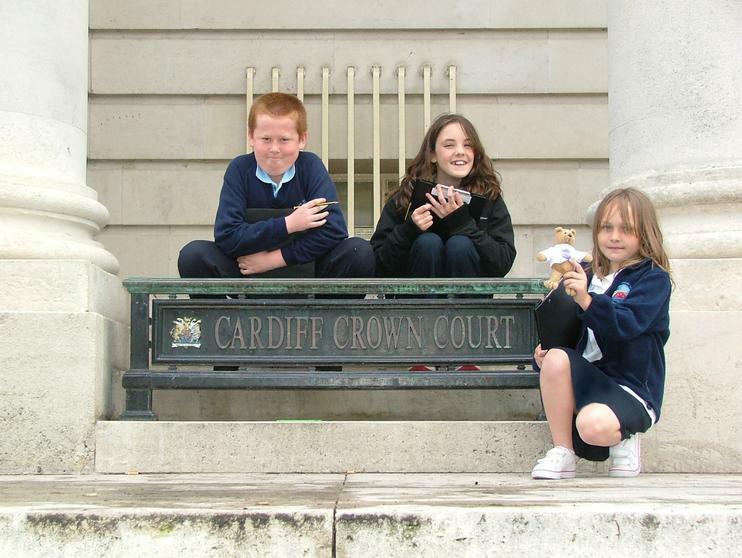 "I was born in Lincolnshire and spent my early childhood in Scotland, but I have been in Cardiff for the past 23 years." 4.) You are quoted as saying you want “to promote the work of the restorative justice programme at Cardiff Prison.” Can you tell us about that? 5.) 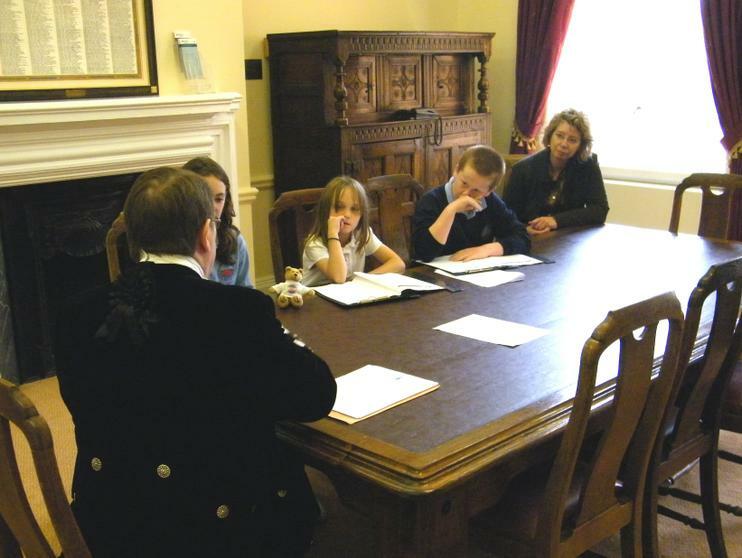 Do you work with the Lord Lieutenant? Have you met the Queen? "Yes. Very closely I am the meeting the Lord Lieutenant Dr Beck tonight. My job is for one year but the Lord Lieutenant who is the Queen’s personal representative holds his office until he reaches the age of 75. No, I have not met the queen yet, but I have met Prince Charles 2 or 3 times and Princess Anne too. I have been invited to a garden party at Buckingham palace and might meet her majesty -albeit briefly- then." 6.) Have you ever played with your sword of office? 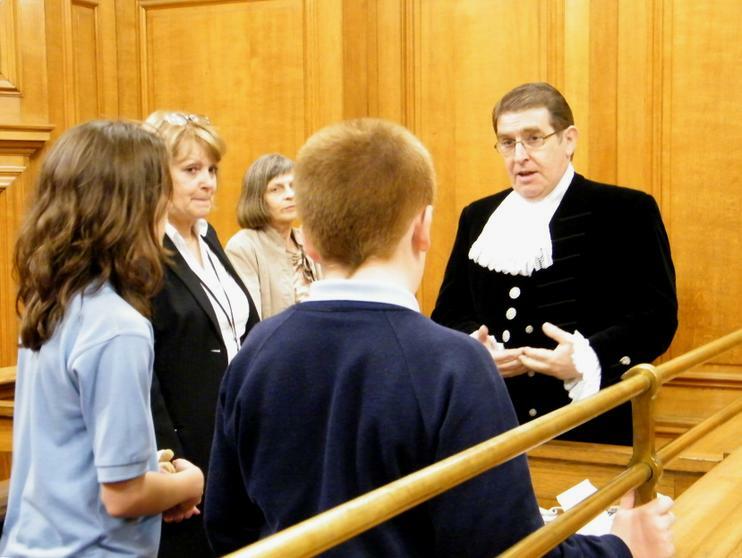 "No I have not, it has been lent to me by a friend who was also a High Sheriff. 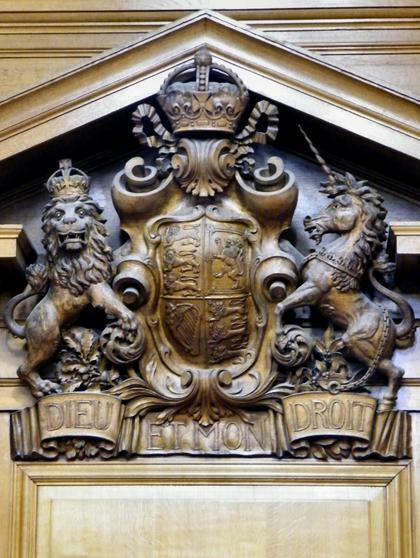 This is a genuine eighteenth century court sword." 7.) What is your best experience so far in the job? Is there anything you are looking forward to? 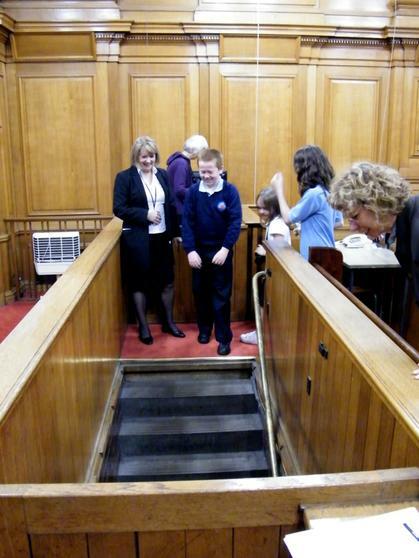 "Well it had been meeting the children from St Helens Roman Catholic Junior School, but meeting you and being shown around the courts has been really good. 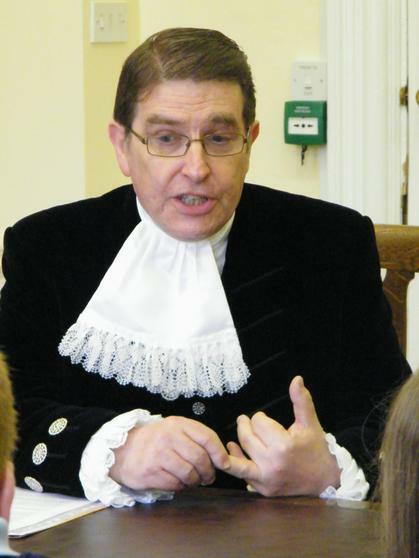 I am looking forward to our fundraising at our Offa’s Dyke walk in October, My wife and I are going to walk the 178 miles for the High Sheriff’s charity which is used to support youth projects and our prison program." 8.) What is your proudest achievement to date? What would you most like to achieve? 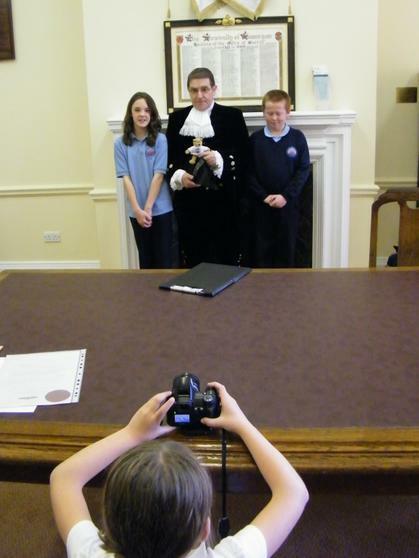 "Being installed as High Sheriff. 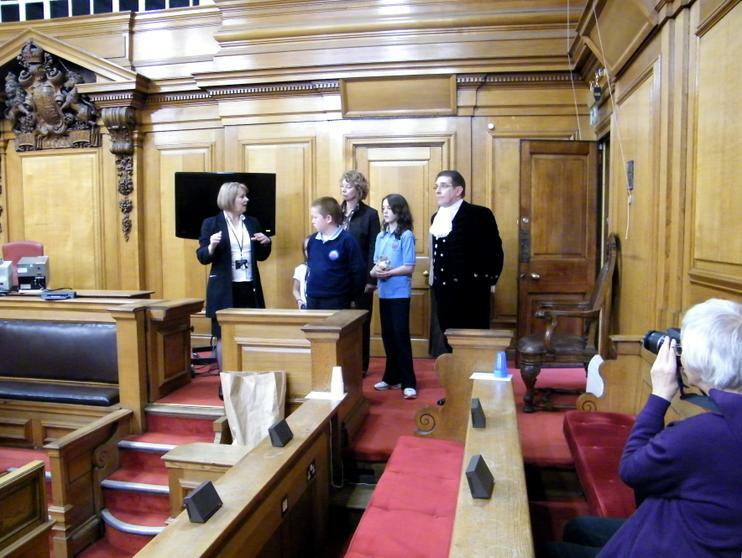 It was an interesting contrast when I was at a ceremony in the Senedd which is one of the newest institutions being a High Sheriff which is one of the oldest offices in Britain. 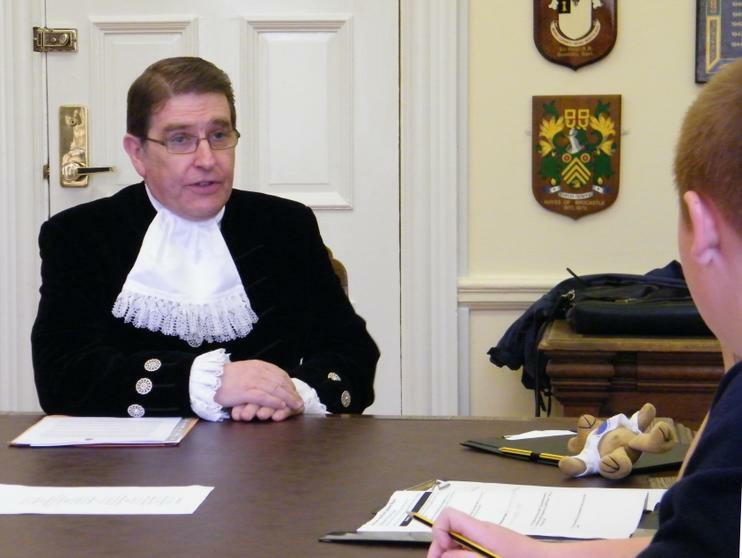 I would like to raise around £15,000 for the High Sheriff’s Charity. 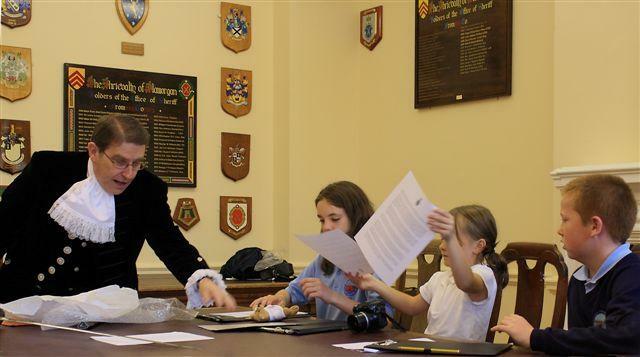 It would also give me great pleasure if people -especially young people- knew and understood more about the role of High Sheriff." 9.) What do you do to relax? What are your hobbies?
" I am still a fully paid up member of the Musician’s Union When I was younger I used to manage an 18 piece Brass Big Band and we used to tour the American Air force bases and play on the Ferries too." "Currently we have inherited our son’s goldfish, Susan also has a 'pet' hedgehog who lives in the garden and she feeds her bread and milk." 11.) 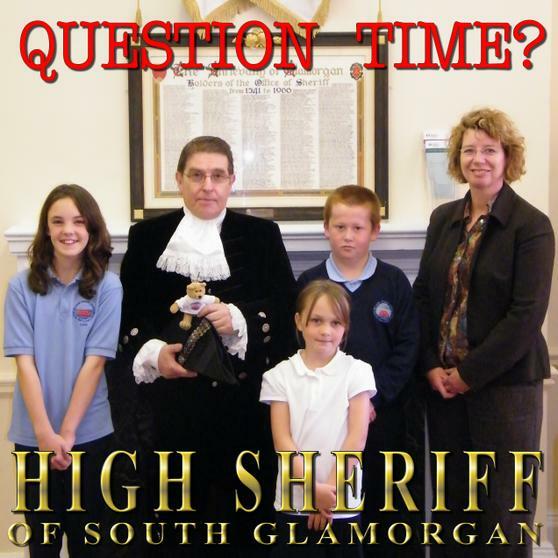 How do you get to be High Sheriff? 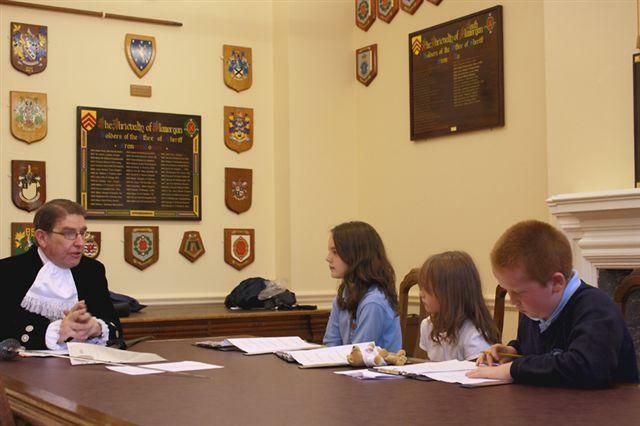 "We are having a meeting tonight to look at the nominations for 2010-11. 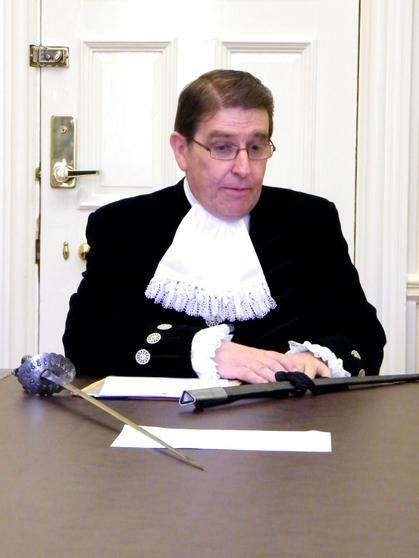 There will be me, the previous High Sheriff Brian Rees, the next High Sheriff Mrs M A Campbell, the Lord Lieutenant Dr Peter Beck and an independent person. 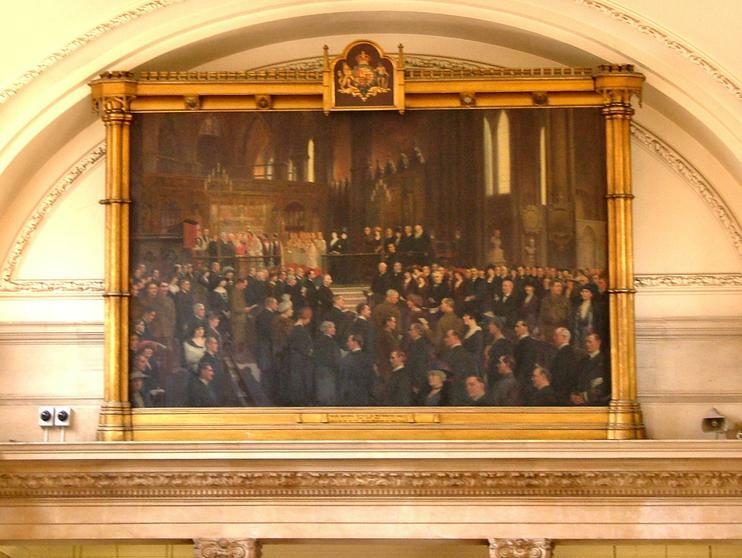 The list of nominations have been prepared through the Privy Council." 12.) What do you think of Robin Hood? "Robin Hood is an interesting Legend and there are some great stories about the characters. He reverses the roles of sheriff and outlaw and actually acts in the interests of the ordinary people; giving back the money unjustly taken from them from a very bad sheriff. There were at least 3 sheriffs in history that abused their power and consequently met a sticky end." 13.) 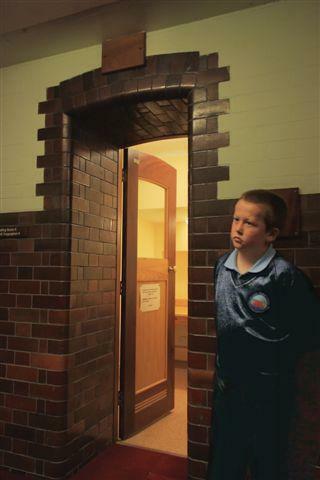 What were you like at school? Swot or troublemaker? "Neither, I was a little chopsy and remember being told off for being talkative at one school. I went to 7-9 different schools because my parents moved around a lot." 14.) What is your favourite film and why? "We have not seen a film in ages we do not watch them I suppose it would be a musical like Westside story. I prefer to watch programmes like ‘Have I got News for you’." 15.) What about your favourite book character, which one would you most like to be? "I tend to read factual biographies and newspapers rather than fiction. I love reading lots of different newspapers to get different points of view." "I love the costume, I find the responsibilities exciting but it is frustrating that there is no funding at all to do all the good work with. We cannot even offset what we spend as Sheriff against the tax we pay, but we all do it for the honour and know beforehand what we are committing ourselves too." 17.) What Football team do you support? "There is only one football team; Manchester United of course! - I was interested as a child but I remember coming home from school one day in 1958 and my mum telling me about the Munich air crash after which I became a loyal follower." Thank you for your time. Are there any questions you would like to ask us or things you want to add? 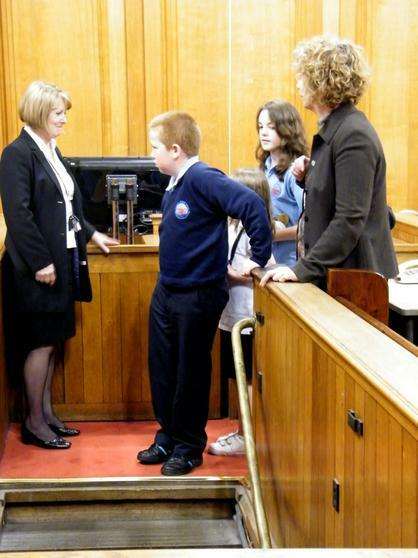 Or would you like to suggest how pupils can work in their community? 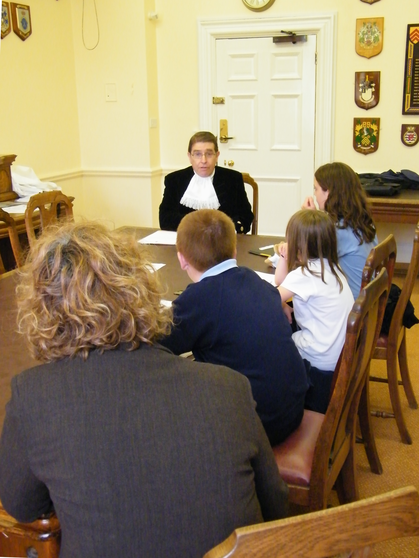 Prof Hazell told us about his uniform known as Court Dress. It can cost over £6,500 to buy a new one but he has bought it from a friend. He asked us if we knew what the lace collar was called; we suggested a 'bib' which made him laugh as the children in Barry did the same. It is called a ‘Jabot’ and was made by his wife from lace made by his daughter who is a deputy head at an infant school. 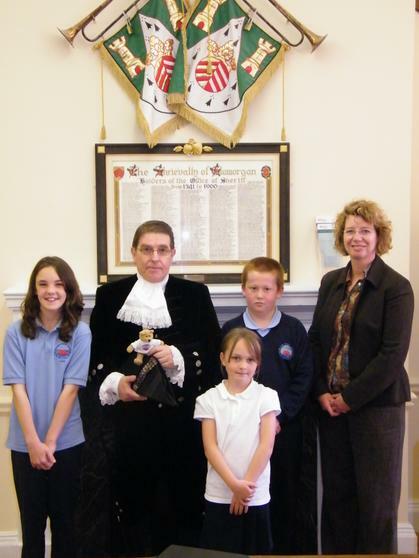 The High Sheriff did say that he would be happy to take some photos of our school mascot Millie on his fundraising walk on Offa’s Dyke and listened to our ideas about how we could work in the community building links with the elderly members who might feel threatened. 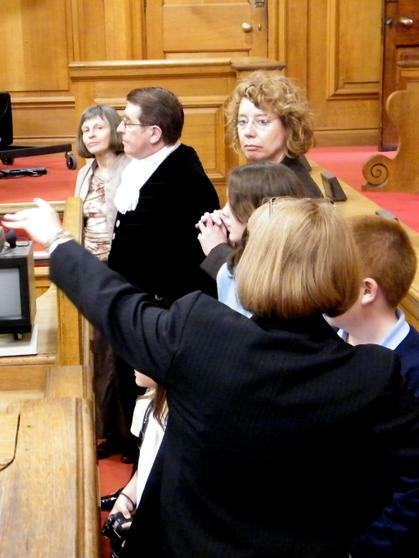 Earlier on in the visit Lynne Mills of HMCS at Cardiff kindly gave the group a tour around the Cardiff Crown Court looking at court room 2 and explained who sat where and why. 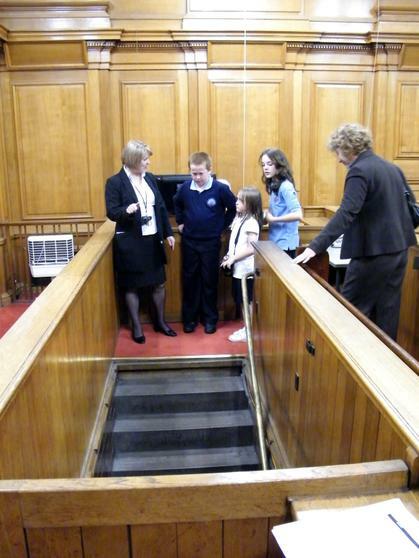 She showed us the ‘dock’ where the defendant would stand and the stairs that led down to the cells. We then looked at the old holding cells which were now converted to offices - they are very short of office space. 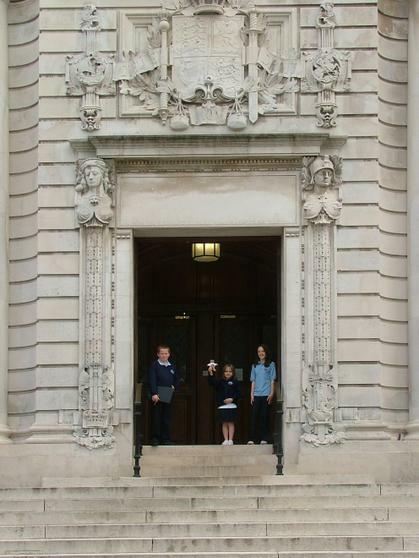 We liked the architecture of the building and the paintings. We all had a great time and learnt a lot. 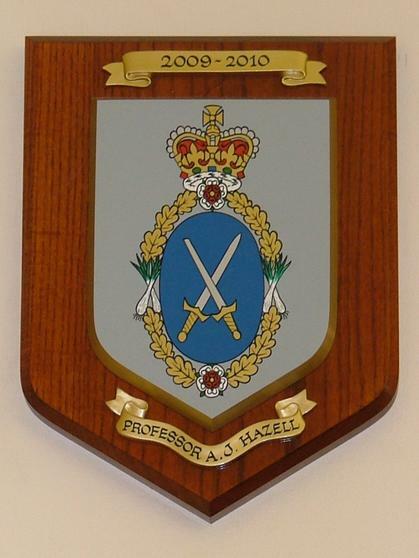 Professor Hazel has had a fascinating life and career and shows no sign of stopping. 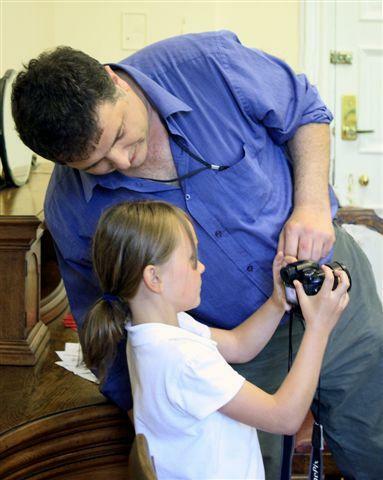 We are really grateful for him and his wife giving up his time to see us, and to their friend Hazel who kindly gave us some of the photographs she took. 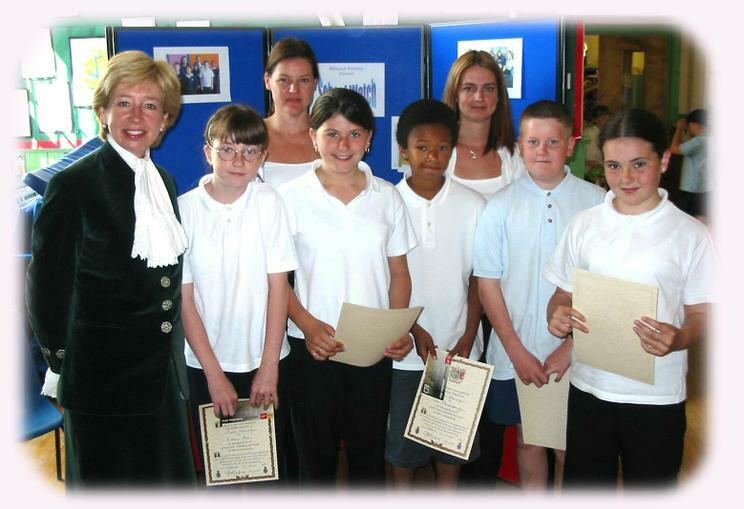 Mrs. Josephine Homfray The High Sheriff of South Glamorgan in 2003 visited the school in June to present certificates to the 'School Watch' the photos and details of that visit were on the old website lost by the Council in 2008 we hope they will put all the photos back online soon.